For a century after the Reformation Witham Catholics were cared for by the chaplains of wealthy families. 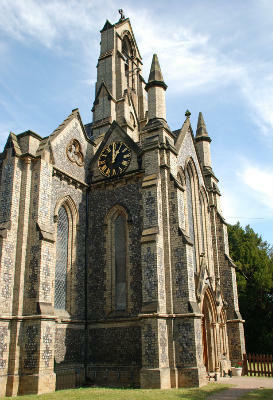 Witham is an old Catholic parish, though, in post reformation terms with roots into the eighteenth century. A house still stands on Chipping Hill which has some “church” style windows and dates from the time when Catholic worship was illegal and Catholic priests regarded as spies and traitors. A goodly number of recusant families and groups were served from Witham which made it an important Catholic centre. In the foyer of the parish church there is a list of post reformation priests in Witham, the first being Francis Thompson S.J. 1777-84. In 1851, soon after Catholic emancipation, a purpose built stone church was erected on the corner of Colchester Road and Avenue Road by what became known as “Catholic Bridge” over the railway. Dedicated to The Holy Family it served as the parish church until 1989 when possession was taken of our present church. The Catholic population had grown considerably with the development of Witham and the capacity of the old church became inadequate. In 1969 the Anglican Church of All Saints in Guithavon Street, a chapel of ease to St Nicolas’ in Chipping Hill, was closed. It had been built just a couple of years before The Holy Family Church. Twenty years after its closure the Catholic Church purchased this redundant building for a nominal fee and then spent a vast amount of time, effort, energy and money on its restoration, re-ordering and refurbishment giving us the beautiful parish church we have today. Out of respect for its history the church was dedicated under the twin patronage of The Holy Family and All Saints. Witham continues to grow and the Catholic Church continues to be a strong and thriving community witnessing to God’s truth in our twenty first century society. In 1929, the centenary of Catholic Emancipation, Cardinal Bourne urged Catholics to build a church in every village in the country. In June that year Fr Richard Gay, Kelvedon's Parish Priest, informed Bishop Doubleday that there were 50 or so Catholics living in Silver End, a Garden City being developed by the Crittal Manufacturing Co. The 8d return bus fare to the churches at Kelvedon or Witham was beyond the means of many and some of the men were war invalids who found travel difficult. Silver End’s Catholics petitioned the bishop for a church and in January 1930, no action having been taken, said they were prepared to take the matter directly to Rome. Fr Gay started a Mass centre in a hut at Silver End later that year where Mass was celebrated every Saturday, at first without the bishop’s knowledge. In 1934, the cost of building a small church was estimated to be £650. In 1936, Witham took responsibility for Silver End and Mass was celebrated in the village hall. In 1955 Fr Francis Wilson, Witham’s Parish Priest asked Bishop Beck for permission to buy a site at Silver End and a plot was acquired for £150 from Crittalls through the generosity of Mr Clifford Heron. Chelmsford Architects O’Neill & Fordham drew up plans for a brick building to seat 100 but little or no money was available. In 1957, Fr Wilson even proposed erecting an existing timber building from Surrey but the scheme was found to be impractical. In 1963 the existing plot was exchanged for another, close to the junction of Sheepcote Lane and Boars Tye Road, owned by Crittalls. Architect Martin Evans was engaged and building began in August 1965. 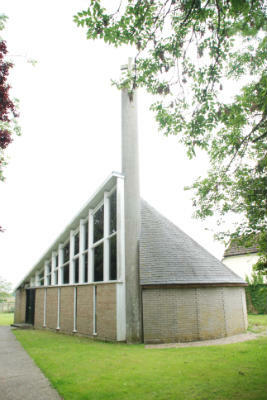 The Church of St Mary, costing £9,000 and seating 70, was opened by Bishop Wall on 9th November 1966. Of a semi-circular, spiral plan in grey brick – it has been likened to a snail’s shell – it was designed to be easily extendable.